A handsome concrete arch railroad bridge that is showing its age. The Stone Cut Underpass (33 0123L) is a single span bridge with dilapidated wingwalls that was built in 1938. 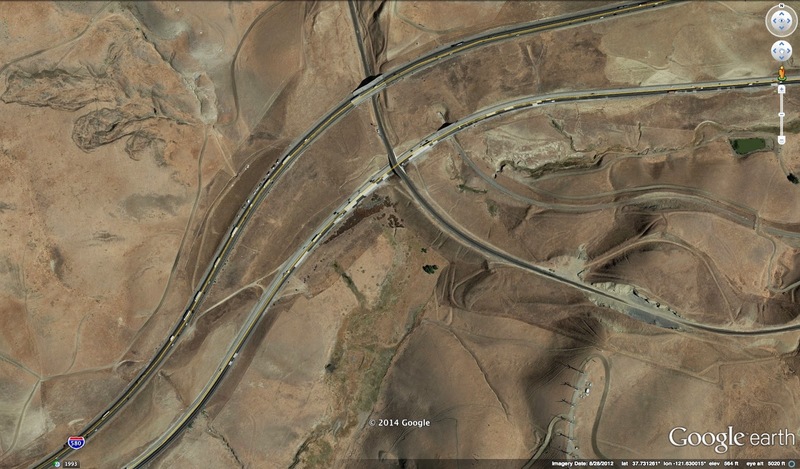 This bridge is newer then yesterday's Altamont Pass Road Underpass because Altamont Pass Road was built before I-580. This bridge must have been quite impressive in a Frank Lloyd Wright kind of way when it was first built. It looks like Caltrans is continuing to cover up the graffitti as soon as it goes up. Most of the joints are coming apart and so I imagine at some point it will have to be repaired. In the photo above (on top of the bridge) we can see how the eastbound and westbound lanes of I-580 are far apart on the eastern slope before Altamont Pass. Westbound I-580 goes over the railroad while eastbound I-580 goes under the railroad. Also you can see a few of the thousands of windmills facing east along this windswept area. Alameda County, California Bridges: Stone Cut Underpass across Eastbound I-580 by Mark Yashinsky is licensed under a Creative Commons Attribution-NonCommercial-NoDerivatives 4.0 International License.